Q: I'm not an "artist", can I still do this? A: Definitely. 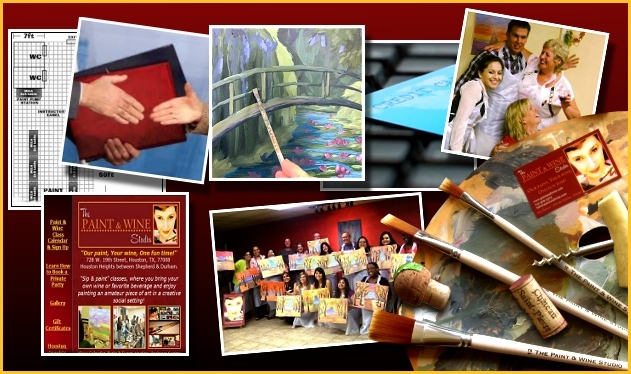 The business concept of "sip and paint" is not to create perfect art, rather, to host an energetic social environment where painting is a fun activity. 95% of our students never painted before. As a host and instructor, the job is to connect and guide the crowd with simple steps -- nothing complicated. 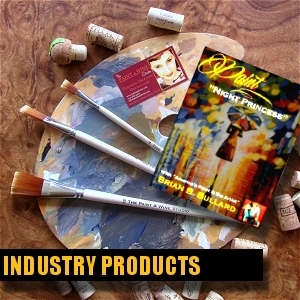 Paintings and level of detail are chosen by the business owner. 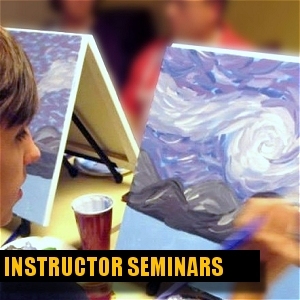 Q: Can I hire an artist to instruct the classes? A: Yes, and as a Consulting Client we will guide you through an easy way to find qualified personnel, to assist as well as instruct. With "GOLD ULTIMATE", we fly in for the Instructor Certification Seminar to train you and your staff. Included is staff training in the "sip and paint" style, classroom operations, setup, hosting, instructional techniques, and more! We will even instruct your Grand Opening event if scheduled in sync with our visit. Q: How much will my costs as a Consulting Client be? 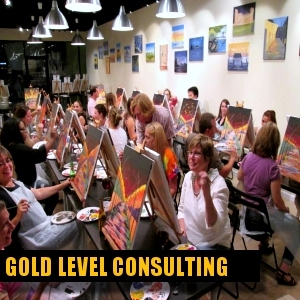 A: The total consulting fees for GOLD (new studio) or SILVER (mobile studio) vary depending on what you need. Additional expenses are -- optional Instructor Seminar and website, initial art and studio inventory, initial advertising & print media. Leased spaces are for GOLD level clients and the rental rate ranges depending on the size and location. In other words, for under $5k you can start your mobile field-based business (no studio, serving home parties, events, associations, etc) and for over $10k you can have a studio-based business, with the option to do offsite parties as well. Please take a look at our special offers, below. Q: I own a business, am fairly knowledgeable in areas like leases, inventory, and dealing with customers...what would you suggest? 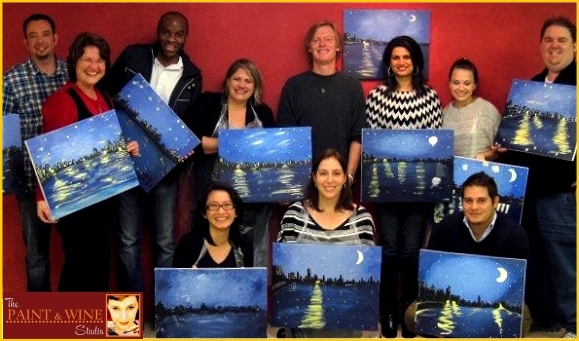 A: "Paint and sip" is a specific industry much different from any other. We do not "part out" our successful programs, we want to be an "open door" to you and your business so we are able to share 100% of our knowledge in order to ensure your success. 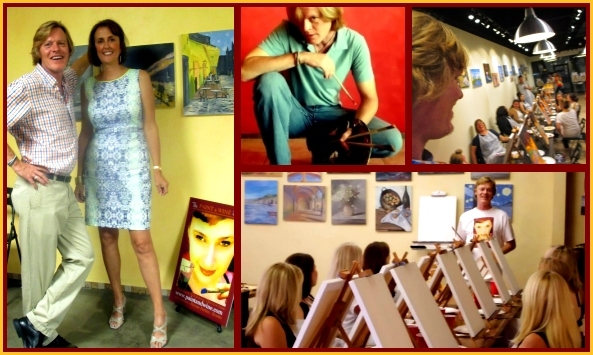 Nobody can top our level of experience in training and creating successful artists and art businesses! Q: What is the "proprietary software" I see mentioned from franchises? A: We've seen this pitch and will be honest with you -- it's not rocket science. We link our Consulting Clients to systems that are affordable, easy to use, and just as efficient as claimed with "Proprietary Management" systems. Q: Why should I establish my business with you vs a competing franchise or business? A: COST-- franchises get a $20-25k plus franchise fee, then come all of the additional costs. It's well known that franchisees have approximately over $100k invested in their business by "Grand Opening" because they have to meet the franchisor's demands and then pay royalty fees for 7-10 years. We can put you into a very solid, self-owned business for a fraction of that amount. 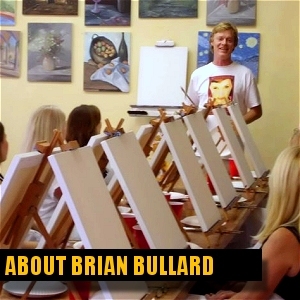 KNOWLEDGE-- on average, our "competition" has only a few years of experience running an "art studio" and being involved in this "new" industry, vs Brian Bullard's 30 plus years in the arts, 23 years as an art business, and 18 of these years as a national-level studio, as well as training students, artists, instructors, and assisting in the development of over 1000 small business and over 38 "paint and wine" oriented art studios. FREEDOM-- as a franchisee, you're bound by agreements and contracts, you won't have the financial or business freedom that "independents" enjoy. You will pay upfront fees, other expenses, and a portion of every dollar you make to that franchise for the length of agreement, currently 5-10 years. With us, you have the freedom to choose everything about your business-- from the way it's run to what you want to offer -- after all, you're paying for it, you own it! We will advise you on the best-proven methods but it's your call in the end!